These days, using secure connections via HTTPS (TLS) and the much more efficient HTTP/2 protocol should be a matter of course for all web applications. You can get a domain validated certificate from Let's Encrypt at no cost to setup transport layer security (TLS). Also HTTP servers and web browsers widely adopted HTTP/2 already. Starting with Java 9 and Spring Boot 2 / Spring 5 you can easily enable web applications to use secure HTTPS/TLS connections and the HTTP/2 protocol. As a developer most of the time you work in your local environment and cannot use any of the officially validated TLS certificates here. Instead, developers are using unsecured connections or self-signed certificates resulting in browser warnings. By setting up a private certificate authority (CA) you will be able to use secured connections without these annoying browser warnings. In the next sections you will see step by step how to achieve this. In practice, all web browsers only support the second variant HTTP/2 over HTTPS (h2). Therefore you have to follow the path to secure your web application using HTTPS connections with TLS (transport layer security). When you read about HTTPS you always stumble upon the terms SSL or TLS. HTTP Secure (HTTPS) is basically HTTP over a TLS connection. Secure Sockets Layer (SSL) is the predecessor of TLS and as such is deprecated and insecure. All SSL versions (1.0, 2.0, 3.0) are vulnerable and should not be used any more. Transport Layer Security (TLS) as the successor of SSL is the protocol that should be used for HTTPS. Currently TLS 1.2 is the one to use with TLS 1.3 being just around the corner. Encryption: All exchanged data is encrypted, so nobody can grab your data just by “listening” to the connection. Data integrity: Exchanged data cannot be modified or corrupted during transfer without being detected. Install the CA-provided certificate in web server (i.e. using a java key store in embedded tomcat of spring boot application). In this blog post I will focus on local development. Therefore in step 2 you will not send the CSR to an official CA. Instead we will setup our private Certificate Authority in the next section. Furthermore for generating certificates and performing sign requests you need the keytool which is part of the JDK. Usually you use self-signed certificates for local development. But these certificates always generate warnings in web browsers and mark all requests as insecure. Currently web browsers also enable the HTTP/2 protocol for TLS certificates having validation warnings. But you as a security aware developer should always be scared when you see such warnings. Consequently to get rid of this warning you have to create a certificate that is trusted by your web browser. To achieve this we have to setup our own private certificate authority (CA). Using the private certificate authority you can later issue a root certificate. Finally you can import this root certificate as new authority in your web browser and sign your server certificate with it. In the first step you need to generate private/public keys and the corresponding certificate for the root CA. Later you will use this root certificate in section for signing your server certificate. This command creates a new java keystore ca.jks in folder root-ca containing the private and public keys. The certificate uses the RSA algorithm with a bit length of 3072 and is valid for 10 years. This includes also the distinguished name CN=My CA,OU=Development,O=My Organization,C=DE. In the next step you create another new java key store file containing the private/public keys for the server certificate. The private key is required to generate the certificate signing request. The CA uses the public key for validating the certificate signing request. You can find the new java key store server.jks in subdirectory server. Again we use the RSA algorithm with bit length of 3072 and set it valid for 10 years. Now you will continue with generation of the signing request for your server certificate. This creates the file server.csr in sub directory server. With the next command you will now sign and export your server certificate using the file server.csr from the previous step. 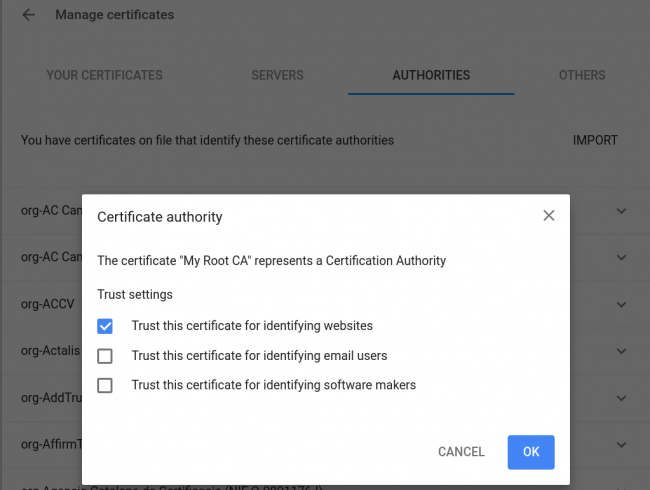 To achieve the required valid chain of trust between the root ca and the signed server certificate you have to perform the following last step. This imports the certificate for the root ca and updates the existing (unsigned) server certificate with the signed one. Finally we have a java key store containing the full chain of certificates ready to be used in our spring boot application. Let’s continue with enabling trust in your web browser for our private certificate authority. We will use the chrome browser here to demonstrate this. Just open the settings in chrome, expand the “Advanced” section and then go to “Manage certificates“. Here you import the root ca certificate from file ./root-ca/ca.pem into the browser as new authority. Don’t forget to mark the first checkbox as shown on the following picture. In an earlier blog post I have described how easy you can create a new web application with basic security in just 5 minutes. You follow the same steps by using start.spring.io, but this time we will use Kotlin instead of Java. To get a simple feedback when testing our simple application just add the following rest controller class DemoController to our new spring boot application. This just prints out a “It works” in the browser when navigating to localhost:8080.
fun index() = "It works"
But still we are using unsecured HTTP connections here. It is time for you to change this just now! To enable TLS put the following entries into your application.properties file. The application is started on port 8443 instead of port 8080 (by convention this is the usual port for HTTPS connections). Important: Please do not forget to copy the java key store file server.jks you have created in previous section into the src/main/resource folder of the new spring boot application. You can now switch on HTTP/2 by adding the following entry to application.properties. Before we can start our application we need to tweak the security configuration a bit. We want to switch off HTTP Strict Transport Security (HSTS) for local development. If we leave this enabled (the default setting for HTTPS connections in spring security) all our applications running on localhost will be forced to use HTTPS by the web browser. This may not be the desired behavior – especially for other local applications that are not configured for HTTPS connections. Now start the spring boot application and after successful start direct your browser to URL https://localhost:8443. Here you will notice the secure HTTPS connection shown as valid by the browser. After providing the user credentials “user” and “secret” you will get the message “it works“. That’s it for this tutorial on Spring Boot Apps with HTTP/2 and TLS. You can grab the complete accompanying project code from my github repository at https://github.com/andifalk/ssl-demo.